If I had been born into a society of cannibals, would I question that society’s behaviors and values, or would I simply be a happy cannibal? Miller searched the entire world for the guidance that supersedes culture, and he found that wisdom in the last - and most obvious - place he looked. "Miller draws the reader in with tales of unforgettable characters in exotic lands. But, what begins as an adventure tale, ends up a modern day travel classic reminiscent of Kerouac’s On the Road or Steinbeck’s Travels with Charley." 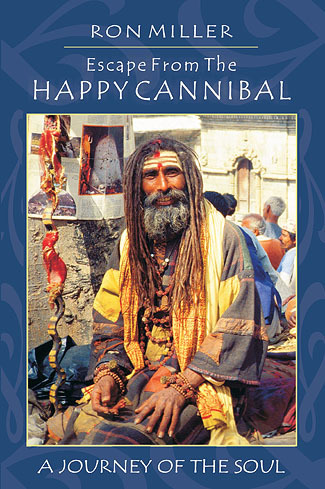 Ron Miller’s unique travel autobiography, Escape from the Happy Cannibal, treats readers to in-depth spiritual and cultural observations gleaned first-hand by the author as he travels to over 80 countries on six continents. Having climbed active volcanoes, trekked with man-eating tigers, and narrowly escaped Rwandan rebels, Miller's journeys are colorful tales of travel coupled with perceptive insights into cultures and peoples. While experiencing a variety of cultures, economies, and governments, Miller uncovers root causes for many of the world’s social and economic ills. During his travels through poverty, tyranny, and racism, he learns not only from his own experiences, but also from the unique perspectives of the fascinating personalities he meets along the way. He eventually discovers that if there is any truth to be found in the world, it must lie beneath the veneer of cultural conditioning.